NightBallet Press: John Burroughs' BEAT ATTITUDE Is Gonna Be Right On at BEATSTREET CLEVELAND! John Burroughs' BEAT ATTITUDE Is Gonna Be Right On at BEATSTREET CLEVELAND! Hey all you groovy guys and cool kitties, hey all you BeatStreet Cleveland beauties, guess what day it is? It's John Burroughs' birthday! And oh daddio, do we have a way to celebrate! Beat Attitude is the 1st title to be released in the 5th season of NightBallet Press--the 80th NBP book--and we couldn't be more pleased that we can tie it in with the upcoming BeatStreet Cleveland event! The book will be officially released at BeatStreet, where John will be performing his poetry accompanied by trumpeter Étienne Massicotte. The book, with a pale ivory cover and burnt orange cardstock insert, boasts a photo of a vivid art piece, "The Tell-Tale Heart," by local artist/poet Kevin Eberhardt. Beat Attitude will pulse in your hand; you can feel the beat in poems that range from the two-lined "Baloney" to the two-paged "Invocation." The book is 32 pages long and contains 23 poems, many of which make specific references to Beat poets, music, or poetry. One of them is "Cannot Believe William S. Burroughs Is Dead." "Burroughs takes up the sledgehammer lying at the base of the wall, and like a tray of glassware hurtling down an elevator shaft, centrifugally levitated, romances blown sunflowers forever drawn to the guard rails." 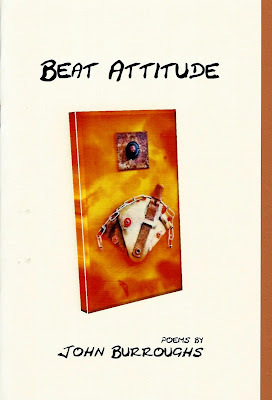 Beat Attitude is only $5 plus $3 shipping (if you are ordering from outside the U.S., please email the editor at nightballetpress(at)gmail.com for a price quote on shipping). If you can't make it out to Cleveland for BeatStreet, order it today and I'll pop it in the mail this afternoon; with any luck and the help of the postal service, you might have it in time to celebrate with us--albeit remotely--on Saturday! John Burroughs is a dynamic and engaging performer of his poetry, and he appears regularly at venues throughout Ohio and neighboring states. He is the author of The Eater of the Absurd (NBP, 2012) and numerous chapbooks. His work has appeared in many publications, including Rosebud, Pudding Magazine, Rubicon: Words and Art Inspired by Oscar Wilde's De Profundus (Sybaritic Press, 2015), Writer Digest's Red Heart::Black Heart, and Polarity. His poem "Lens" was nominated for a Pushcart Prize. Since 2008, he has served as editor and publisher for Crisis Chronicles Press. Read much more at www.crisischronicles.com. Salutations and congratulations from la frontera.